The year is 2014 and The Academy is celebrating its 87th year. Director Alejandro Gonzalez Inarritu's Birdman won Best Picture. It was also the first time in five years that every Best Picture nominee won at least one award. Birdman was also the first Best Picture winner to do so without a Best Editing nomination since Ordinary People. Inarritu was also the second-consecutive Best Director winner to be of Mexican heritage. Birdman's Emmnauel Lubezki's Best Cinematography win made him the fourth person to win consecutive Oscars in the category. Robert Duvall's Best Supporting Actor nomination for The Judge made him the oldest acting nominee ever at the age of 84. 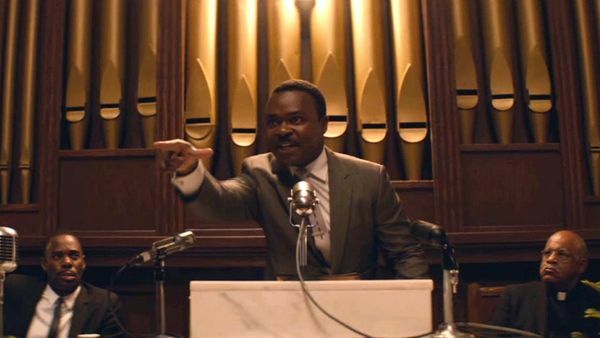 Meanwhile, Selma marched with "Glory" on its way to a Best Original Song win. The only good thing to come out of this song was the Lego Oscar. Everything else is contrived ear worm material. Speaking as I like both Tegan and Sara and The Lonely Island, it is unfortunate that I can't stand this song. It doesn't really have much in the way of substance and the chorus is about the only thing that has given this any form of a legacy It's a mediocre song, and it shouldn't have been nominated just like the movie wasn't for equally rational reasons. The only positive that I hope comes from this is that this means that any song from Popstar: Never Stop Never Stopping stands a chance of making this year's cut. Trust me, that is an inspired soundtrack that puts "Everything is Awesome" to shame. There's so much that works about this song on a base level. It has the soaring chorus that captures its essence. There's the sincere lyrics that create a deeper emotion. It feels like Rita Ora actually is grateful. While I do wish that there was a bit more of a hook to it, it does work as a general pop song. It fills the listener with wonder and makes them appreciate everything more. It's not a great song, but it's a strong filler nominee that is very well produced and captures at its center what the nominees of recent years should have: passion. Song: "I'm Not Gonna Miss You"
Seriously, let's ask ourselves why this didn't win. It has the same emotional impact that the more publicized Johnny Cash cover of "Hurt" had. It's so earnest and passionate that it tears right to the core. You feel sad as the man sings directly to you. My one concern was that this song doesn't hold up without the context of Glen Campbell's failing health. I think it does, and it reflects the rare gift of an artist who is able to perfectly expose himself in his autumn years. Seriously, this is like the inspired levels that David Bowie's "Blackstar" did earlier this year. It's an emotional roller coaster. I wonder if this only lost because of the Oscars So White backlash and the idea of awarding a country song would be seen as appealing to old white people. Seriously, this puts Crazy Heart's "The Weary Kind" to shame. It's so good, especially in an otherwise not awesome year. This is quite the year for filler nominees. Begin Again is a terrible movie, so it is a relief that the one song that spawned from it was a quaint little pop ditty. It manages to have the swaying vibe of contemplation that makes generic pop work. It doesn't have much else going for it beyond that. It's just a song that feels manufactured to produce this philosophical bent that we're all "lost stars" as the song puts it. Adam Levine in context is fine, though I don't know that he brings anything exceptional to it. This song is so middle of the road. I fear that this is the caliber to which all future Oscar nominated songs will strive. Help us if this is true. We really deserve better. I get why this song won. It definitely has the power to move the audience, especially in juxtaposition to Selma. It has so much rich content that explores America's Civil Rights history. It is a well crafted, well produced song. My issue is that I don't feel like it is more than a message song with the corny addition of Common rapping great ideas over it. John Legend solo could've knocked this out of the park. It has so much going on that it's easy to ignore that some of it is a tad predictable. I think it is a song that won mostly for its time and place. Then again, it probably also won because this was such a mediocre year for music. Who knows.